Within the pages of Striking Thoughts, you will find the secrets of Bruce Lee's incredible success- as an actor, martial artist, and inspiration to the world. Consisting of eight sections, Striking Thoughts covers 72 topics and 825 aphorisms-from spirituality to personal liberation and from family life to filmmaking-all of which Bruce lived by. His ideas helped energize his life and career and made it possible for him to live a happy and assured life, overcoming challenging obstacles with seeming ease. They also inspired his family, friends, students, and colleagues to achieve success in their own lives and this personal collection will help you in your journey too. John Little is considered to be one of the world's foremost authorities on Bruce Lee. He's the only person who has ever been authorized to review the entirety of Lee's personal notes, sketches and reading annotations, giving him an insider's look at Lee's training methods and philosophies. 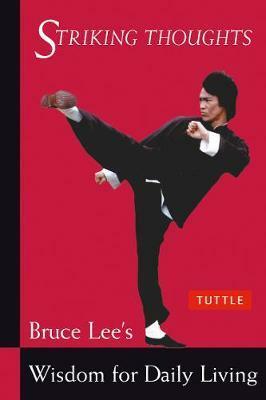 He's shared this information with Lee's fans in his books published by Tuttle Publishing, including: Bruce Lee: Artist of Life; Jeet Kune Do: Bruce Lee's Commentaries on the Martial Way; Letters of the Dragon; The Tao of Gung Fu: A Study in the Way of Chinese Martial Art; Bruce Lee: The Art of Expressing the Human Body and Bruce Lee: The Celebrated Life of the Golden Dragon.